Click the ‘Networking‘ button in the top menu. Select ‘Add IP address‘ section of your server options. Choose which cloud server to route the IP address to. Once you have added a new IP, you will need to update your operating system before it will recognise it. Please follow the instructions for your operating system below. Your IP address should now be available (you should see it listed if you run the command ip addr). Repeat the process for any additional IP addresses. DEVICE — This should match the end of the filename ie. eth0:0 for the file ifcfg-eth0:0 or eth0:3 for the file ifcfg-eth0:3. IPADDR — Add your new IP address here ie. replace 10.20.30.40 in the example below. NETMASK — Enter 255.255.255.255 as the subnet mask (or enter the subnet mask for your private VLAN if this IP is from that range). Connect to your Windows server using remote desktop connection. Open ‘Network and Sharing Center‘ (by right-clicking the network monitor icon in the system tray and selecting it from the menu, or by searching for it from the Start menu). Click the ‘Change adapter settings‘ link (towards the top-left of the window). Right-click your network connection eg. ‘Ethernet‘, and select ‘Properties‘ from the menu. 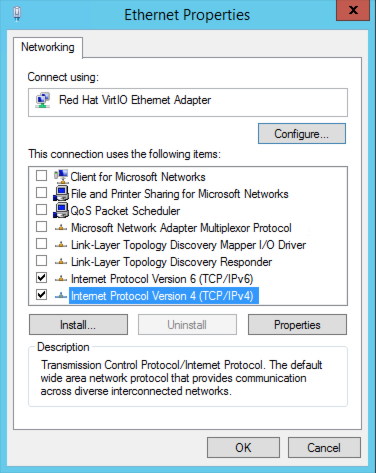 Single-click the ‘Internet Protocol Version 4 (TCP/IPv4)‘ option to highlight it (ensure the checkbox remains ticked) and click the ‘Properties‘ button. Click the ‘Add...’ button at the bottom of the ‘IP addresses‘ section of the window. Enter the new IP address and ‘255.255.255.255‘ as the subnet mask (or enter the subnet mask for your private VLAN if this IP is from that range) and click the ‘Add‘ button. Click the ‘OK‘ button to close the previous windows. Your IP address is now available to be used. Repeat the process if you want to add another IP.